As fighting rages in Iraq, most Americans (54%) say they approve of U.S. airstrikes against Islamic militants there, while 31% disapprove. But while the public backs airstrikes, there is widespread concern about the U.S. becoming too involved in Iraq. Overall, 51% say their greater concern about military action is that the U.S. will go too far getting involved in the situation. Fewer (32%) say they are more concerned that the U.S. will not go far enough in stopping Islamic militants. The new national survey by the Pew Research Center and USA TODAY, conducted August 14-17 among 1,000 adults finds wide partisan divides in views of the Iraq situation. 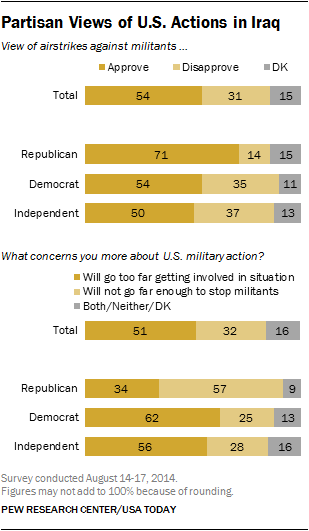 Republicans strongly back U.S. airstrikes against the militants by a 71%-14% margin. In addition, Republicans are far more concerned that the United States won’t go far enough to stop Islamic militants (57%) than that the U.S. will get too involved in Iraq (34%). By contrast, Democrats express more modest support for the airstrikes (54% approve, 35% disapprove). By a 62%-25% margin, more Democrats say their greater concern is that the U.S. will get too involved in the situation, than that the U.S. will not do enough to stop Islamic militants. 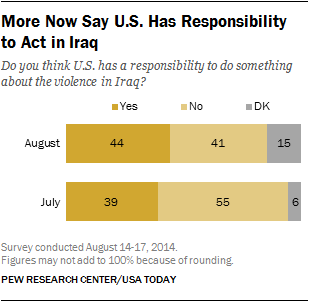 The public is split over whether the U.S. has a responsibility to act in response to the violence in Iraq: 44% say that it does compared with 41% who say it does not. A month ago, more people thought the U.S. did not have a responsibility to address the violence in Iraq (55%) than said it did (39%). Currently, the percentage saying the U.S. has a responsibility to act in Iraq is far higher than for other international conflicts during Obama’s presidency. In December 2012, just 27% said the U.S. had a responsibility to act in response to fighting in Syria. In March 2011, an identical 27% said the U.S. had a responsibility to do something about fighting in Libya, shortly before the U.S. and its allies launched airstrikes in Libya. In the current survey, a majority of Republicans (61%) – including 68% of conservative Republicans – say the United States has a responsibility to do something about the violence in Iraq. Democrats are divided: 43% think the U.S. has a responsibility to act in response to the violence in Iraq. Just as many (43%) say it does not have this responsibility. The views of liberal Democrats on this question are no different than those of conservative and moderate Democrats. Since July, there has been a 23-point increase in the percentage of conservative Republicans saying the U.S. has a responsibility to deal with violence in Iraq (from 45% to 68%). Among Democrats, the share saying the U.S. has a responsibility to act has risen more modestly, from 35% in July to 43% in the current survey. In addition to divides across partisan lines, views of Iraq differ greatly across age groups. People under 30 are less likely than older adults to approve of U.S. airstrikes, and are far more likely to express concern about deepening U.S. involvement in Iraq. Overall, 45% of those 18-29 approve of U.S. airstrikes against militants in Iraq, while 36% disapprove. By comparison, those 65 and older approve of U.S. airstrikes by more than two-to-one (61%-25%). In addition, nearly seven-in-ten of those under 30 (68%) say their greater concern about U.S. military action in Iraq is that the U.S. will get too involved in the situation; just 21% are more concerned that the U.S. will not go far enough stopping the Islamic militants. Among those 65 and older, about as many are more concerned that the U.S. will get too involved (41%) as worry it will not do enough to stop the militants (39%).